What Is SQL (Sales Qualified Lead)? In most CRM systems, the term sales qualified lead (SQL) designates a lead that has been vetted to fully fit prospective customer profile. The SQL pool is formed by working with marketing qualified leads (MQL) and weeding out leads that don't fit the SQL profile. Here's an example that shows the difference between SQL and MQL. Suppose you sell X-ray machines to dental clinics. Your experience shows you in order to sell you equipment successfully, the following conditions must be true - the clinic should have at least five dentists working there and their existing X-ray unit has to be at least five years old. Your marketing department obtains a list of all dental clinics in the state. These are MQLs, because dentists are your target market. However, this list contains no information about the number of dentists working for each clinic and the age of their X-ray equipment. You'll need to call or visit each clinic in order to obtain this information. Only the clinics that meet your buyer profile will be added as SQL. Most modern CRM software allow you to automate the process. If you are looking for free CRM and lead management software with over 20 sales and marketing tools, consider Bitrix24. Most of the CRM applications with free basic plan allow only couple of users to have free account but Bitrix24 allows 12 users to create free account with 5 GB space. That is likely enough for a small or medium business to get start. – CRM includes almost all major business requirements like sales automation, contact management, quote management, business rules automation, invoicing, reports and sales funnel, direct email or call to clients from dashboard, integration with third party applications. It has mobile app for iOS and android to browse client records, create quotes, verify product catalog. – It provides inter company social networking with ‘Like’ button, instant chat facility, computer telephony integration, photo and video sharing capability. It also includes employee motivational tools like badges, awards to show appreciation towards co-workers. – It provides 5 GB free space for online file storage and document collaboration. There is no other CRM right now that provides 5 GB space with free plan. Also users can create or edit documents in Bitirx24 without any office suite. – It has built in task and project management capability as well. 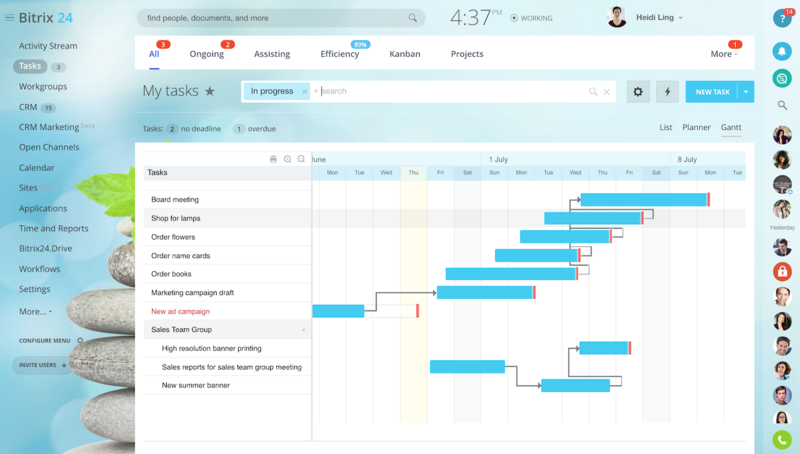 Task can be created for oneself or assigned to colleagues, task report helps upper management to understand how much time an employee spends on a particular task. Overall Bitrix24 is an application that helps an organization to run from one place. Zoho is well-known CRM application with great features. It has web apps for almost everything that aSME needs like CRM, email integration, file sharing, social networking. It’s free edition allows an organization to create 10 free accounts with 1 GB space and limited functionalities but all these are sufficient for a small or medium company to generate leads, manage contacts and increase revenue. – CRM includes almost all important features that an enterprise needs like sales force automation, marketing automation, lead management, contact management, quote management, live chat and email, tasks and activities handling, business rules and workflow management. – It provides 1 GB space to an organization as document library. It can be used for file/folder sharing and documents attachment with file versioning capability. – Zoho can be easily integrated with social networking sites like Twitter / Facebook or other Zoho apps like Zoho Projects, Zoho SalesIQ. It can be synchronized with various Google apps as well like Google calendar, Google contacts. Also it provides web to lead and web to contact form facilities to capture leads or contacts in web forms. Insightly CRM free edition grants 2 free accounts per organization with 200 MB storage. It includes almost all basic CRM features like Contact Management, Project Management, Task/Event/Calendar Management, Opportunity Management, Social Networking, Reporting, Email Integration. It provides the capability to import contacts from Gmail or Outlook or a simple spreadsheet. Main drawbacks of Insightly CRM Free plan – it limits to store only 2500 records and allows to create 8 custom fields. Also its free plan does not include email marketing. But if these limitations are acceptable and want a simple way to start CRM, it is worth to give a try. Capsule CRM is another lightweight and user friendly CRM application. Its free version provides very basic CRM functionalities with 2 free user accounts and 10 MB file storage. Beside CRM functionalities like contact management, opportunity management or task management, it has an unique feature called List. List uses filtering criteria based upon any possible options in CRM like name, updated on, type or status to group similar kind of contacts or opportunities or cases. With CRM object navigation bar at the top, there is a text link bar as well to bookmark contacts, cases or opportunities that you have accessed recently. Though it has good integration capability with other third party applications, free version has very limited integration features. Another drawback with free plan is that it allows to store only 250 contacts with unlimited opportunities and unlimited cases. Really Simple Systems CRM is really simple application with great functionalities like Sales automation, Contact Management, Opportunity Management, Task and Activities handling, Reporting. It’s free edition allows 2 users to have free account and 100 MB file storage. It also includes integration with KashFlow and SageOne accounting applications, custom reports, custom fields on all objects. Drawbacks: Free plan supports only sales automation, not marketing automation or customer service management. Also it limits to create only 100 accounts with unlimited contacts, tasks and opportunities. Provocation As Branding Strategy - Yea or Nay?